Nina Zschocke’s visual irritation – in comics? Happy Women’s History Month, everyone! Last year I realised I had written only one single blog post about a female art historian / scholar / theoretician, so this year I scheduled two posts on women (that I would have written anyway) for March. This first one is about a German book that was published only ten years ago, Der irritierte Blick: Kunstrezeption und Aufmerksamkeit by Nina Zschocke. Unfortunately there doesn’t seem to be an English translation of it yet. The title can be roughly translated as, “The irritated gaze: art reception and attention” (albeit “irritated” in the sense of “confused”, not “annoyed”). The first ~70 pages of Der irritierte Blick form an introduction to reception aesthetics and its psychological prerequisites. This first part is well worth reading in itself, but the second part introduces Zschocke’s concept of visual irritation with which we’ll deal today. Recipients are visually irritated when they “think their visual interpretation is ‘wrong’ because it contradicts other assumptions or information about the perceived situation” (all translations mine). Within visual irritations, those that contradict basic rules of perception acquired during childhood (regarding the formal attributes of colour, shape and space) can be distinguished from phenomena that contradict assumptions “of a higher level”, i.e. regarding the perceived content. Another distinction can be made between stable “illusions” and multistable phenomena: multistability occurs when several mutually exclusive interpretations appear equally plausible. In any case, the viewer sooner or later experiences a sense of failed perception and irritation. Zschocke’s point is that visual irritation is an artistic strategy. Contemporary artists (Zschocke examines the examples of Josef Albers, Anish Kapoor, and Thomas Demand, among others) deliberately compose their works in such a way that the recipients are astonished, their perceptual sensitivity is heightened and their attention is turned back on itself, so that they are encouraged to reflect on the act of perception. Does visual irritation occur in comics too? A prime example of a visually irritating comic might be L’Oud Silencieux (Die Schweigende Laute / “the silent oud” or “lute”) by Martin tom Dieck (L’Association, 1996). This wordless 22-page comic has a page layout of two panels on top of each other. From the panel transitions it soon becomes clear that the horizontal connections across pages are stronger than the vertical ones on the same page. In other words, the upper panels tell one story (a man playing an oud) and the lower panels another (a man dreaming of some sort of fairy). So far, so interesting. While the two stories seem entirely unconnected at first, it is fun to look for similarities between them. For instance, both men watch television at some point. Furthermore, one man falls asleep and wakes again when (i.e. on the same page as) the other stops and starts playing his oud. 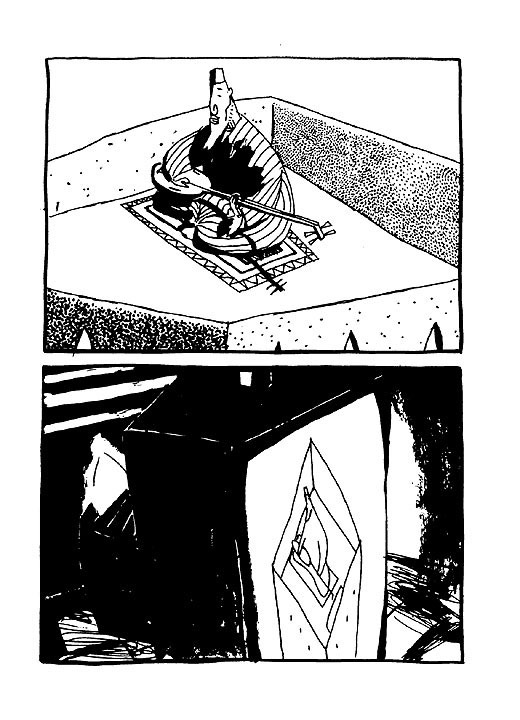 The real point of visual irritation occurs on the fourth page: on the top panel, the oud player sits on his rooftop, while on the lower panel we see the other man’s television. The funny thing is, the television screen shows the oud player on the rooftop from the top panel. So clearly the two stories are connected after all. However, what is their exact chronological or spatial relation? I can’t think of a single completely satisfying explanation. For instance, the upper story cannot be a film that is shown on the TV in the lower story, because when the man in the lower story wakes up (p. 20), his TV is blank instead of showing what’s going on in the upper panel. Thus L’Oud Silencieux contradicts the reader’s assumptions about comics, as the sequence of images in a comic is usually thought to be “intended to convey information”, as Scott McCloud’s famous definition says. (The second part of this quote, “… and/or to produce an aesthetic response in the viewer”, is often forgotten.) Ultimately, the recipient is left visually irritated and, perhaps, pleasantly amazed. 1. size – the larger a figure is depicted, the more likely this artwork will instil a feeling of presence. 2. deixis – the more the work is deictically orientated towards the beholder, e.g. if figures seem to look or point at the beholder, the higher the degree of presence. 3. obtrusiveness of medium – if there is a clash of different diegetic levels within an artwork, the degree of presence is reduced. These criteria can be readily applied to a single image like a painting or a photograph. A comic, however, consists of multiple images, and the presence of each panel is influenced by the panels that surround it by means of contrast and progression. Another typical feature of comics is written text: speech bubbles, captions etc. do not co-exist with the drawings on the same diegetic level, thus betraying the mediality of their panels and reducing their degree of presence. A comic that makes striking use of effects of presence, which makes it a suitable example here, is the superhero series The Ultimates by Mark Millar and Bryan Hitch (Marvel 2002 – 2004). The characters in this comic are often placed on splash pages and/or seemingly address the reader, resulting in a considerable experience of presence. Ernst Gombrich’s Art and Illusion – in comics? Heinrich Wölfflin once said, “not everything is possible in every period.” Ernst Gombrich takes this statement as a starting point in his book Art and Illusion (first published in 1960 but based on a lecture series from 1956) and asks: if artists always want to represent what they see as accurately as possible, why do their results look so different from period to period? In other words: why does art have a history? Gombrich’s main explanation is the “tenacity of conventions”. There is an “enormous pull in man to repeat what he has learned”, and only “exceptional beings” are occasionally able to “break this spell and make a significant advance” (pp. 24-25). That’s why, according to Gombrich, art has slowly become to look more and more lifelike. So where do comics fit into this model? Gombrich actually mentions them as part of the “victory and vulgarization of representational skills” (p. 8), which had become ubiquitous in the (i.e. Gombrich’s) present day. Is that really the end of the story? Do comics constitute the apex of artistic illusion? Probably not. I think comics retain some features which Gombrich assigns to earlier periods, or “primitive” art. One of these features is the treatment of local colour. In earlier times, artists didn’t try to represent the colour of an object as they perceived it (not an easy task, as Gombrich explains), but instead chose colours that fit into a specific overall tonality, as was demanded by the taste of the public of that day (chapter I). When I was reading the first Justice League Dark trade paperback the other day, I found traces of both of these “primitive” characteristics in it. Justice League Dark was (at that time, 2011) written by Peter Milligan, drawn by Mikel Janin, and coloured by Ulises Arreola. I’ll write more about this interesting series in a later post, but for today, let’s look at p. 9 of the third issue. As for the second feature, June Moone’s face (her “characteristic shape”) is always shown more or less frontally on this page, regardless of where her body is orientated towards. Often, the figures in this comic are reminiscent of amateur stage actors who are taught to always face the audience so that they can be heard better. Deadman is shown twice frontally and twice from behind, but his red-and-white shape is easily recognised from any point of view – unlike June Moone, the unexceptional supporting character. We need to see her face to instantly recognise her. I’m not saying the art in Justice League Dark is bad. It’s just in accord with the current style in mainstream superhero comics, which values clarity higher than accurate representation of the artists’ perception. The readers need to be enabled to easily read the comic and identify the important elements on the pictures, in order to understand what’s going on in the story. The story, not the look, conveys the atmosphere. In such a paradigm, there is no place for ambiguity. That being said, Art and Illusion is a rich and diverse book. For a different connection to comics, see Nicolas Labarre’s article “Art and Illusion in Blutch’s Mitchum” at The Comics Grid. Also of interest to the comics researcher might be chapter X of Art and Illusion, “The Experiment of Caricature”. In case you were wondering: no, this article isn’t about comics. But my previous blog posts about Michael Fried from February last year and photography theory from January last year are connected to it (and of course my conference paper on “presence in comics“, which will be published too, eventually). Svetlana Alpers’s modes of representation – in comics? In 1983, the same year in which her book The Art of Describing came out, Svetlana Alpers published an interesting essay in the journal Representations, titled “Interpretation without Representation, or, the Viewing of Las Meninas”. In this article, she describes “two modes of representation that are central in Western art” (i.e. pictorial art, primarily figurative painting). Basically, these modes are specific constellations of perspectival, deictical and above all diegetic dispositions. A picture in the first mode – the “Albertian” mode, after Leon Battista Alberti – “is conceived to be like a window on the perceived world”. That is, the recipient is aware that the picture was made by an artist, and from a particular point of view. Thus, the recipient in front of the picture takes on the same position as the artist when he or she beheld the scene that would become the subject of the picture. (In contrast, Alpers writes that “the artist positions himself on the viewer’s side of the picture surface”, but I’m describing things from the reception side here.) Cues for this mode can be artificial compositions of objects framed to be painted, such as a sitter posing for a portrait, or objects which appear to have related to the artist in some way, such as a figure seemingly looking at the beholder/artist. The second mode of representation – “the northern or descriptive mode” – is characterised by the perceived absence of the artist. The picture looks as if “the world produces its own image”, a “replicative image”. Such a picture “does not assume the existence of viewers prior to and external to it”, but it may contain “a figure situated as a looker within” who does not appear to look out of the picture, or at least not towards the position of the artist/viewer. In a way, such a device is similar to Michael Fried‘s concept of absorption. Does it make sense to look for these representational modes in multi-image works such as comics? It might, if we assess the mode for individual images and then extrapolate to determine the predominant mode of the work as a whole. In Alpers’s main example, Velázquez’s Las Meninas, the two modes are intertwined, but for simplicity’s sake let’s assume here that as a rule, either one mode or the other is employed in any given picture. I’ll contrast the two modes of representation with each other by using two older manga as examples, Barefoot Gen by Keiji Nakazawa, and Haine by Kyōta Kita and Keiko Ogata. Let’s stark with the more obscure one, ハイネ: 愛と革命の詩人 / Haine: ai to kakumei no shijin (“Heine: poet of love and revolution”, published in German as Heine in Japan in 1988). It is the biography of the German poet Heinrich Heine (1797 – 1856), who actually had never been to Japan. 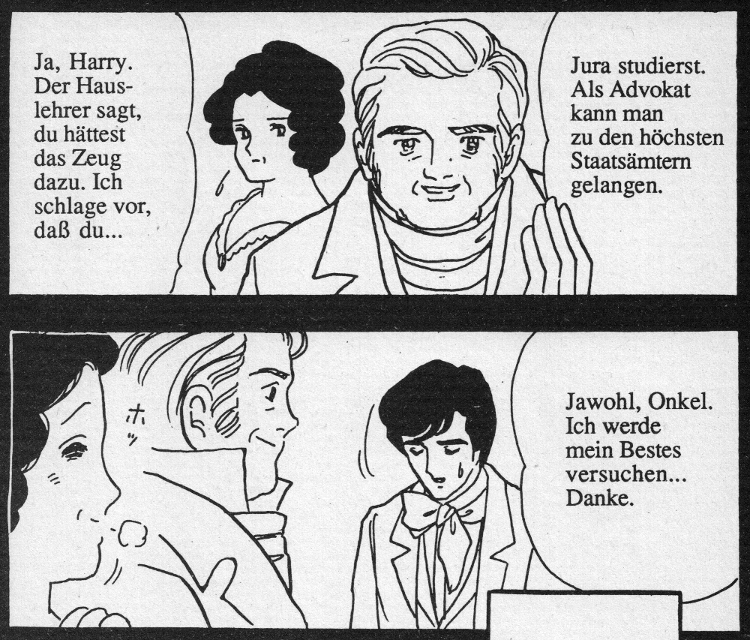 In these two panels from p. 35, we see the young Heine in conversation with his aunt and uncle. The figures in the top panel look orthogonally out of the picture so that we, the readers, feel as if they were looking at us, and as if we’d look through Heine’s eyes. In the bottom panel, the arrangement of the figures makes us imagine we stand right next to Heine’s aunt, as if we were a fourth family member taking part in the conversation. Both panels are clearly composed in the Albertian mode of representation, as they give the impression of a plausible human point of view. This mode is predominant throughout the comic. In contrast, consider these two panels from the beginning of the classic Barefoot Gen (はだしのゲン / Hadashi no Gen), on p. 3 of the German one-volume edition from 1982. The top panel shows running feet, seen from slightly above ground level. On the bottom panel, we see the Nakaoka family fleeing into an air raid shelter, depicted from a slanted view from above. What these two points of view have in common is that they can hardly be said to show the action from a human perspective: it is unlikely that a figure within the story could perceive things from the same position as we, the readers, do. Therefore, we can say the descriptive mode is employed here. Particularly the oblique and elevated point of view of the bottom panel is a frequent device in Barefoot Gen to freshen up traditional “shot/reverse shot” dialogue scenes. Our analysis of the modes of representation shows that in each of the two comics, a mode is chosen that complements it: Barefoot Gen is based on its author’s personal experiences, but in order to show that the horrible events depicted in this comic are neither purely fictitious nor singular, the descriptive mode of representation is used to make them less personal and more credible. In Haine, on the other hand, the Albertian mode is used as an invigorating device that puts the reader into the action and almost turns this second-hand account into an eyewitness account, thus bridging the gap of 150 years between our time and Heine’s. Heinrich Wölfflin’s plane and recession – in comics? Welcome to the second installment of what might become a series of blogposts on classical theories in art history and their relation to comics. Twenty years after Franz Wickhoff’s Wiener Genesis, Heinrich Wölfflin published his seminal book Principles of Art History (Kunstgeschichtliche Grundbegriffe, München 1915), in which he introduced five pairs of terms with which the formal differences between Renaissance and Baroque style can be described. Let’s focus on one of these pairs, plane and recession (“Fläche und Tiefe”), which achieved additional notoriety through the excerpt reprinted in the textbook Methoden-Reader Kunstgeschichte. According to Wölfflin, Renaissance painting is characterised by planar composition in layers parallel to the picture surface, whereas in Baroque painting, the depth of the pictorial space is emphasised. In order to find other whether these different modes of composition can be found in comics, I’ll now turn to two more or less randomly selected examples from titles I had been reading lately. Page 7 of chapter 26 (in volume 6) of Tsutomu Nihei’s シドニアの騎士 / Shidonia no Kishi (Knights of Sidonia) consists of four panels, each of them an example of planar composition. In the first panel (in “Japanese” reading direction from right to left), the space ship crew members are arranged in a row nearly parallel to the picture surface, which only slightly recedes to the right. Panels 2 and 3 show computer screens, the first one being tilted sideways but still, again, parallel to the picture surface (the English lettering is somewhat misleading). Finally, in the last panel of the page, the figure is almost exactly frontally orientated towards the picture surface, while the background is largely undefined. In contrast, .hack//黄昏の腕輪伝説 / Tasogare no udewa densetsu (.hack//Legend of the Twilight) by Rei Izumi and Tatsuya Hamazaki employs quite a different style, for instance in the first three panels on page 2 of chapter 7 (in volume 2). In the first panel, the ground is tilted towards us, so that we look down on the wolf at an angle, which allows us to perceive the wolf and the space in which it is placed as three-dimensional. In the second panel, the four characters are arranged in three tiers, receding from left to right so that we are pulled into the depth of the pictorial space. Likewise, in the third panel, we look onto and over the wolf’s head and follow its gaze towards the character Mireiyu, thus experiencing once more a pull diagonally into the picture. What do the differences between those two examples tell us? I wouldn’t go as far as saying that Nihei’s personal style is planar, while Izumi generally favours recession. In fact, even within these two volumes, both compositional modes can be found. What we can see, though, is that plane and recession fulfil different tasks: planar compositions are useful to convey information to the reader, whereas recession puts the reader into the midst of interactions between characters. I still think Wölfflin’s principles are useful for stylistic analyses of comics, but the samples would have to be much larger.